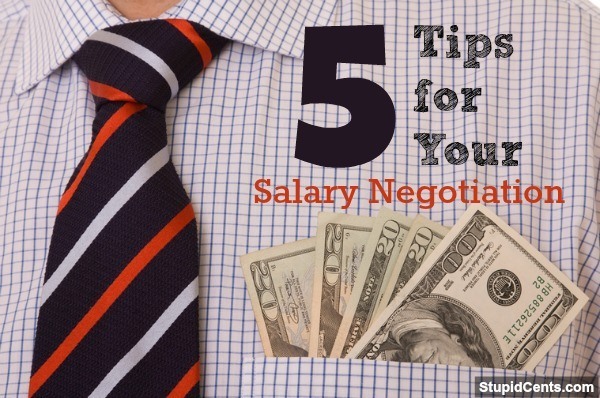 One of the touchiest aspects of getting a new job is the salary negotiation. If you negotiate too low, then you could lose out on tens of thousands of dollars over your lifetime. If you ask for too much, the employer might decide not to hire you after all, since you are too expensive. One of the first rules of any negotiation is to get the other party to make the opening offer. Delaying the salary negotiation until the very end, when you’ve proved you’re what the employer wants can help. Then, wait for the employer to make the first offer. You can get a good feel for what the employer wants to pay, and then make a suggestion from there. If you can avoid being the first one to throw out a number, the better off you are likely to be. When you are finally forced to enter into the salary negotiation in earnest, try not to throw out a single number. Instead, offer a range that makes sense for your area. Do the research ahead of time, so that you know roughly what someone with your education and experience makes in similar situation in the job’s local area. If you can offer a range of $15,000 to $20,000 dollars, you can get a negotiation going within set parameters. So, instead of saying that you want $55,000, say that you were thinking of a range between $50,000 and $65,000 — or even a range of between $52,000 and $72,000. What the employer says next in terms can guide you into settling on something that makes a little more sense for your situation. Don’t get so hung up on the money that you forget other forms of compensation. What kind of benefits can you get? Be flexible. If you can negotiate flexible work hours, the opportunity to telecommute two or three days a week, or some other benefit that you find important, include those items. It can be worth it to accept a little less in terms of pay if you have other benefits and perks. Be clear that you are willing to be flexible on salary if you can have a little more flexibility with other aspects of the job. Part of the salary negotiation should include a demonstration of your value. What do you offer? Do you have hard evidence of your accomplishments? If you can show that you increased positive outcomes, and that you have reached certain benchmarks and milestones, or that you can bring in clients or other business, you can command a higher salary. Finally, whether your salary negotiation is for a raise in your current job, or whether it’s for a new job, you don’t want to get personal. Don’t talk about how you “need” a certain amount of money to support your family, and don’t share sob stories about your financial situation. You need to focus on what you can do for the company, and the value you can add as an employee. What do you think? What is your best salary negotiation tip? I work at a city job that has some set in stone salaries. I hope to try these tips out at some point once I have established myself at a different job. I am perfectly happy to just stay under the radar and not get noticed until I am able to leave my current job. If I went to my boss demanding a raise right now, it might not work out so well for me. The biggest tip I have used myriad times in the past is the willingness to turn down an offer that doesn’t match my expectations. If you ask for $50-60k, and the employer comes back with, “we really can’t go above $40k”, and it’s truly too low for you, you need to say, “thanks, but no thanks” and walk away.